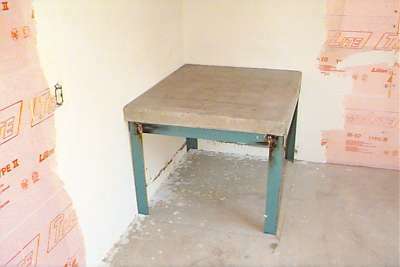 concrete base pad for oven. The black 220v. 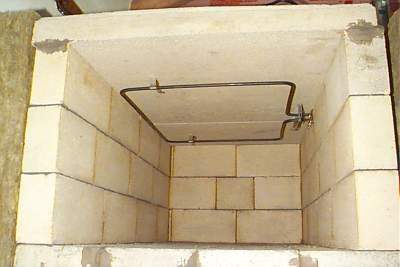 power supply cable for the oven can be seen hanging from the ceiling. 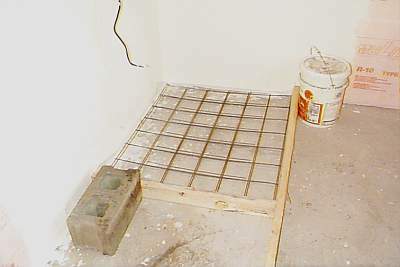 Slab is formed. Form is lined with 6 mil poly. 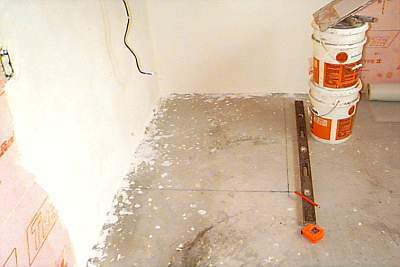 A 24" x 36" rectangle is marked out on the slab. 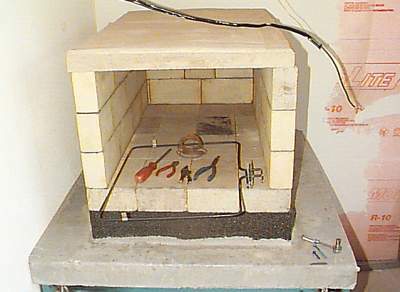 A hearth of 6" x 9" x 3" firebrick is set dry onto the foamed glass. 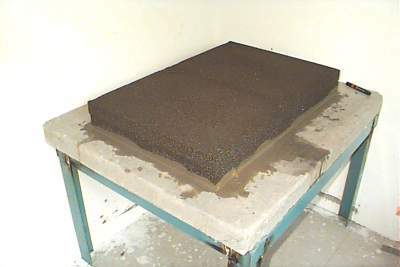 The foamed glass has a compressive strength of 100 psi. 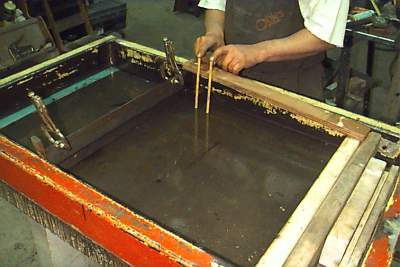 strip that separates the slab into two pieces, for easier handling later. The material for the ceiling will be "Kast-Set" from A.P. 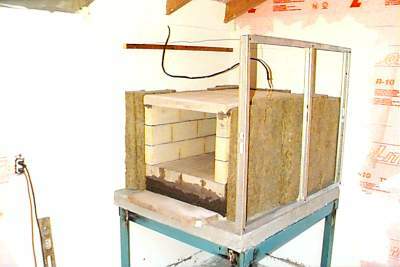 Green Refractories. 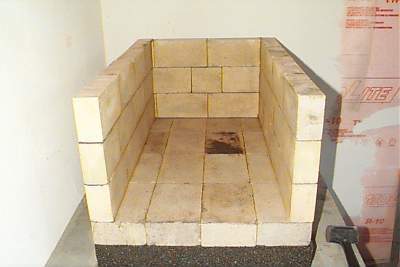 The side and back wall are built from standard 4.5" x 9" x 2.25" firebricks. 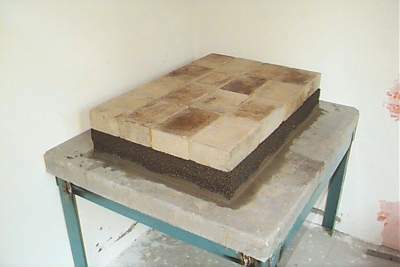 The bricks are set in a thin bed of clay. Right side is framed with metal studs. 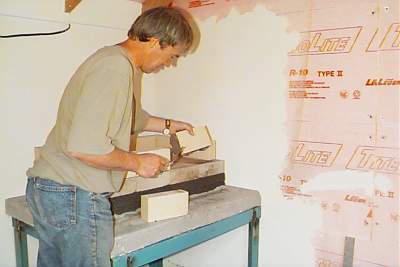 A wooden ledger is glued to the left wall. are fireproof, more rigid, and easier to work with. 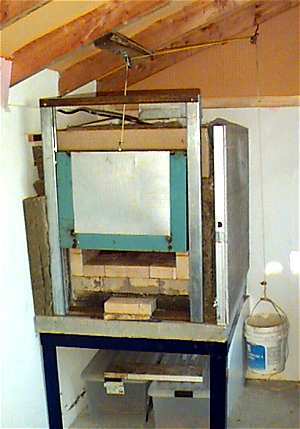 A piece of Foamglas is used as a temporary oven door. added. Thermal shocking was cracking the bare Foamglas plug. 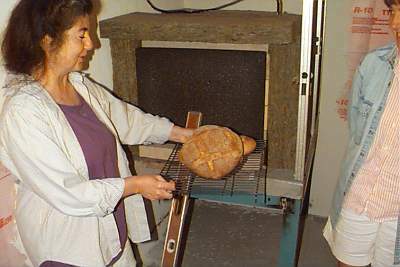 A data acquisition system has been installed to record oven temperatures. 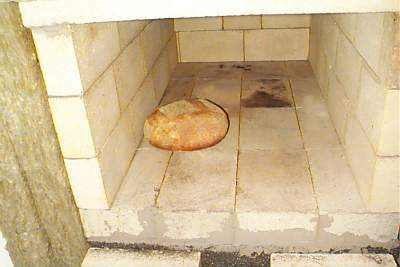 The data will determine if more mass should be added to the oven before finishing. and the number of bakes between recharging the mass with heat. as well as providing an on-screen temperature readouts and a graph. 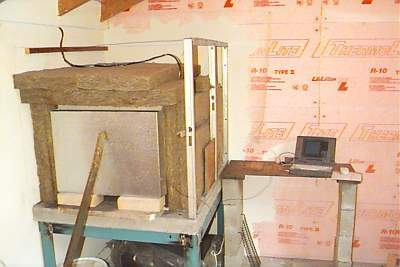 2.5" thickness has been added to floor, and oven is in use while data is gathered. 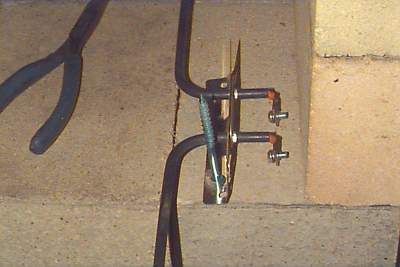 inside standard sliding door track. Right side is closed in with cement board screwed to the metal studs. The sliding door has been insulated with 2" foamglass and a sheet metal cover. 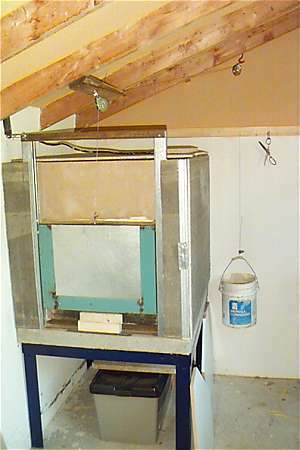 Door mechanism comprises a rope, 2 pulleys, and a partially filled bucket of sand. 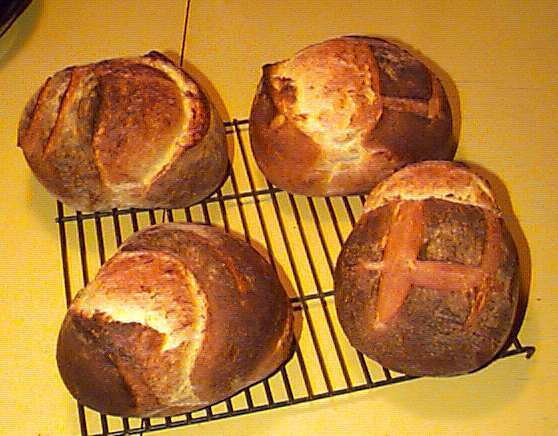 Oven temperature record over 5 full days. 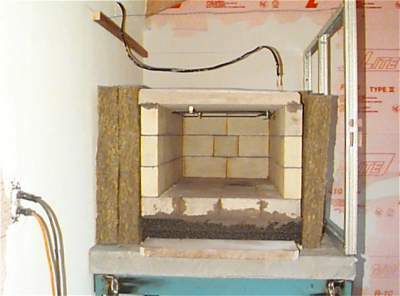 When oven is refired and then turned off, note initial steep temperature drop as heat soaks from surface to inside of bricks. 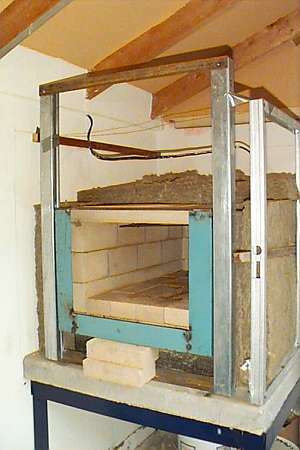 Once bricks are stabilized, drop off is very slow, for example from 490 to 316 in 24.75 hours. 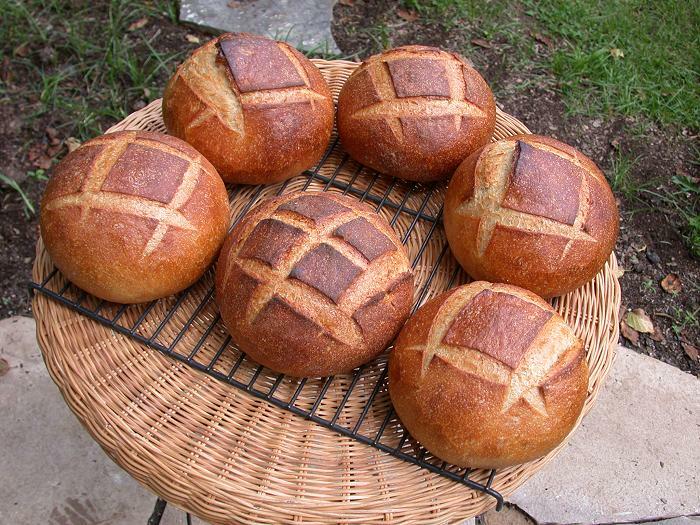 The oven has been in regular use for making levain, an authentic French style country loaf using sourdough only, no yeast.